Don’t get me wrong; I love the Opus card. It has made using public transit in Montreal a lot easier, at least in terms of buying and using tickets and passes. The single, rechargable “chip” card makes a lot of sense, and I’ve had no real problems with it. Well, except for what I’m about to describe. Some background: I live “off island,” on the South Shore of Montreal where the transit system (RTL) is separate from Montreal’s STM. Generally, this presents no problem; I pay a bit extra to get a monthly pass that I can use on both systems. (The standard STM monthly pass is $72.75, while my combined RTL/STM pass is $113). Before the Opus system was installed, the pass was a paper card with a magnetic stripe. I’d get in line a few days before the end of each month and would buy a new pass for the upcoming month from a ticket agent. I had to buy these passes at the terminus in Longueuil, as they were not for sale at the regular STM outlets. Again, not a problem as I passed through the terminus twice a day, five days a week. 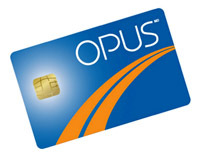 With the Opus card it’s even easier. I have one rechargeable card that I can recharge at a machine. Sadly, although Opus recharging machines exist in virtually every Metro station on the STM system, I could only recharge my combined RTL/STM pass at the terminus Longueuil. A bit of a setback, but no biggie since passing through the terminus was part of my commute. Then, last June, I was thrust into a new situation. Due to an externally imposed (but ultimately welcome) “sabbatical,” I did not have a need to commute into Montreal five times a week. I knew I’d be going into town frequently, but I didn’t think it was worth buying a full monthly pass. I thought it might be better to buy my tickets a la carte. RTL tickets are needed to ride the bus from my house to the Terminus Longueuil, where the STM Metro’s yellow line terminates (and all RTL busses terminate). Those tickets are $3.10 each, or six for $16.75. STM tickets are needed to ride the Montreal Metro and bus system. Those tickets are $3.00 each, or six for $14.25 and 10 for $22.50. RTL tickets can only be purchased at Opus machines at the Terminus Longueuil, on the ground floor level. Regular STM tickets can only be purchased at Opus machines in STM Metro stations, with the exception of the Longueuil station (and most likely the Laval stations). Special Longueuil STM tickets can only be purchased at Opus machines at the Terminus Longueuil, on the Metro level (the level below where the Opus machines for the RTL are). Did you catch that? I have to go to three different locations to buy all the tickets I need to get around on a per-ticket basis. 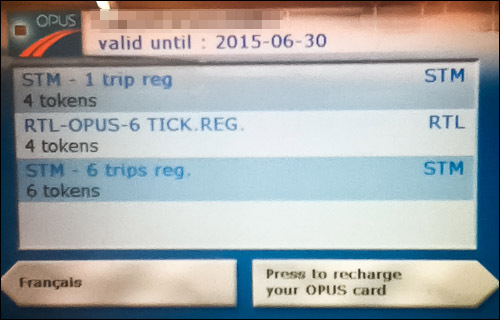 Once you’ve put the three different kinds of tickets on your Opus card, you have to keep track of how many of each you have left so you don’t end up stuck with the dreaded red light on the turnstile when you’re in a big hurry to get somewhere. This would be OK if the readers on the Opus machines gave a clear indication, but they don’t. They do not distinguish between the two different kinds of STM tickets! Here’s a blurry picture of what my Opus card contained one day a couple of weeks ago. It shows how many tickets I have for each of the three variations. The one in the middle is obvious, as it says “RTL.” But can you tell which, between the top one and the bottom one, is the regular STM tickets (for use only on the island of Montreal) and which is the one I need to enter the system in Longueuil? The solutions are easy, at least in theory. The hard part is getting the human beings behind two or more disparate systems to work together for the benefit of the riding public. Believe me, that’s no easy task. …then I’d know at a glance what tickets I have available. It’s a simple matter of labeling. Is that so hard? This bit is harder because it involves (a) getting networks to work together (somewhat difficult) and (b) getting people to commit to getting networks to work together (very difficult). If the networks had better awareness of each other — and the labels were clearer — then I’d be able to go to any Opus recharging station anywhere on the system and load up with whatever tickets I need. The most frustrating part is that the systems are aware of each other; at any Opus recharging station all three types of tickets are shown on the console. They just don’t let you purchase anything other than the ones that are allowed at that station. That is as stupid and user-unfriendly as anything I’ve seen, and it is (at least in theory) easy to fix. I used to hate beans. Couldn’t stand them in any variety or variation. Fortunately I managed to get over that dislike a few years ago and my colon is eternally grateful. While I’m still not crazy about classic old fashioned baked beans (I can’t fully erase my childhood revulsion) I’ve become a big fan of some of the bean dishes that I’ve discovered since my turnaround. These include refried beans, bean salads, pork and beans, and the ultimate simple bean dish, Tuscan white beans with sage. That last dish, Tuscan white beans with sage, is little more than white beans done up with a bit of garlic, sage, olive oil, and tomatoes. Martine introduced it to me a few years ago as a dish she used to make when she lived in San Francisco. 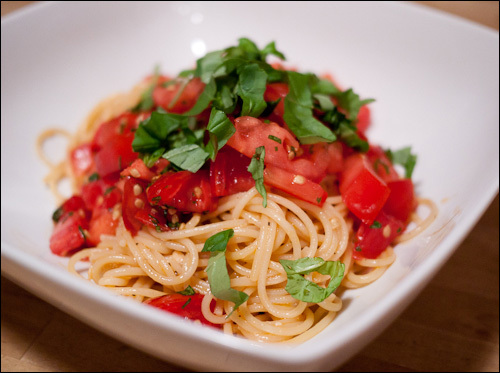 The classic Tuscan way is to go very light on the tomatoes or even omit them entirely. But Martine and I are not Tuscan so we gladly go heavier on the red sauce because we like it so much. Intentare una causa su di me. 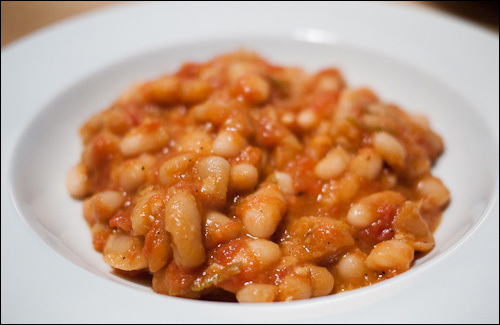 One of the keys to good Tuscan bean dishes is to use the right beans. There are, in fact, many types of Italian white beans, but the ones you are most likely to find on this side of the pond (and which are, for my money, the best choice anyway) are cannellini beans. It gets complicated because there seems to be some confusion here in North America as to what exactly are cannellini beans. The Italians don’t seem to have any problem with this, but most North American sources I’ve checked say they’re just white kidney beans. You might even find an Italian source who agrees, but if so it’s because that Italian source doesn’t really know American white kidney beans. The two are related, but are not the same. True Italian cannellini beans have a longer, more oblong shape than kidney beans (which are, ahem, kidney shaped). More importantly, cannellini beans have softer and more delicate skins, and a noticeably creamier interior. Taste-wise, they’re probably similar although I have not done a side-by-side comparison of undressed beans. But the texture difference is significant, and it’s enough to make me seek out the real thing for more refined bean dishes such as Tuscan white beans or Pasta e fagioli all’isolana. White kidney beans, on the other hand, are better for dishes where there’s a lot more stuff in the pot, such as chili. In my experience – which admittedy is not vast but at least notable – I have not been able to find real cannellini beans that are sourced from North America. I recently bought some Canadian white beans that were labeled as both white kidney beans and “cannellini” (the quotation marks were on the label). They were not cannellini beans. They were decent enough white kidney beans, but not cannellinis. Here in Montreal I’ve only found two brands of authentic Italian cannellini beans (both imported from Italy). The easiest to find are the Bioitalia brand organic cannellini beans, which you can find at any decent natural foods store and most Italian grocers (such as Milano on Boul. St-Laurent and the Valmont chain of green grocers). You can also find them in the specialty section of most regular supermarkets like IGA, Provigo, and Loblaw’s. They’re not cheap; they generally run between $2.50 and $2.80 for a 398 ml can. By the way, forget about finding them dried. I’ve looked all over and haven’t found them. Martine saw some marked “cannellini” in a store on Market Street in San Francisco but it was too large a bag to lug around all day so she didn’t buy them and therefore I can’t comment on their authenticity. 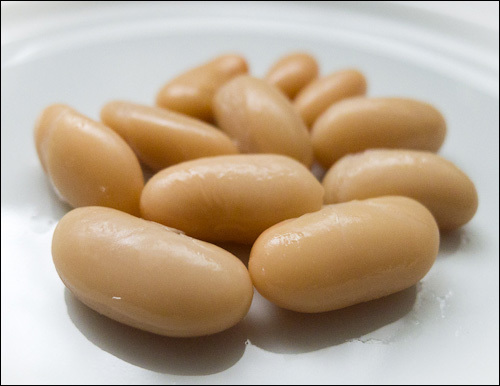 There’s a place where you can order US-grown so-called cannellini beans online, but shipping to Canada is expensive, and based on the photographs on the site they look like white kidney beans, not cannellinis. Thus, if you find yourself contemplating a bean recipe that calls for cannellini beans, be aware that you can substitute white kidney beans or even white navy beans, but your result will not be as refined and luscious as if you take the trouble to seek out and use the real thing. After all that, here’s something to get you started. 2 400 ml cans of cannellini beans, drained and rinsed. 1/2 a 800 ml can of whole Italian tomatoes. (You can use the other half of the can that you used a few days ago to make Pasta e fagioli all’isolana). Warm half of the olive oil in a deep saucepan and add the garlic. Sweat the garlic for a couple of minutes, stirring frequently, until it starts to turn translucent (don’t let it brown; the heat should be low enough that the garlic barely sizzles). Add the sage and stir for 30 seconds or so. Add the tomatoes and turn up the heat so it simmers. Stir and use a wooden spoon to break up the tomatoes. Simmer uncovered for about 15 minutes, checking two or three times to make sure it’s not cooking too hard (give it a stir and further break up the tomatoes). Add the rinsed cannellini beans and a bit of salt and pepper. Cover and simmer for another 20-30 minutes, again checking two or three times, and gently stirring. Turn off the heat. Stir in the rest of the olive oil. Check, and if necessary adjust, the seasoning. Serve hot or warm with a sprinkle of grated Parmesano Reggiano. Yeild: four side dishes or two hearty mains. This goes well with grilled Italian sausages, roasted meat or poultry, or on its own with some crusty bread and a salad. Note: For a more “authentic” Tuscan version, cut the amount of tomatoes in half and add a bit more olive oil at the end. For a super saucy version, double the amount of tomatoes used. This is how tomatoey the recipe above makes it. Don’t freak out, I haven’t become a vegetarian (not that there’s anything wrong with that). While I am trying to cut down on the amount of meat I eat, this recipe was borne of necessity: I was out of pancetta. As I was getting the stuff ready, I found myself thinking of spaghetti carbonara and wishing I hadn’t run out of pancetta. Then it occurred to me; if I added eggs, I would essentially be making spaghetti carbonara, minus the pancetta and plus the mushrooms. 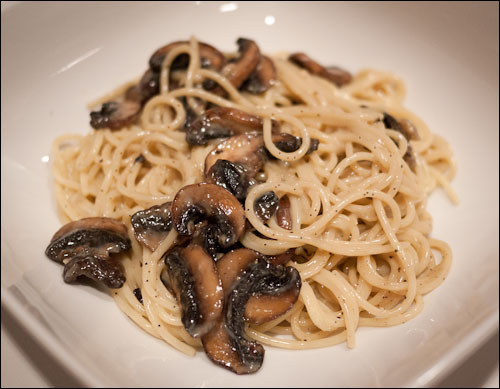 But here’s the thing; the mushrooms in this dish are not intended to imitate pancetta. That would be a hopeless ambition. However, I wanted to make sure the mushrooms were as unctuous as possible so as to at least put them in the same neighbourhood, a sort of umami that would not be found by merely sautéing the mushrooms. That meant I had to literally brown the mushrooms. So what, you might say. Browning, sautéing. What’s the diff? Well, most people never actually brown the mushrooms that they think they’re browning. If you load up the pan with mushrooms and then sauté them (which means to cook them quickly while stirring or tossing) they will cook but they won’t really brown. 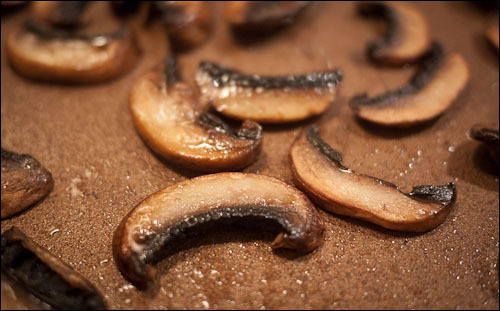 You’ll probably have to brown your mushrooms in two or three batches, depending on how many you’re browning and how big your pan is. I used a 10-inch skillet and it took two batches to brown a dozen mushrooms cut between 5 and 7 mm thick. So here’s the deal; to brown the mushrooms, put a thin coat of olive oil in the pan and heat it up until it’s shimmering. Then put the mushrooms in the pan, one by one, until the pan is full of mushrooms with a good half centimeter distance between each. This distance will increase as the mushrooms give off their liquid. 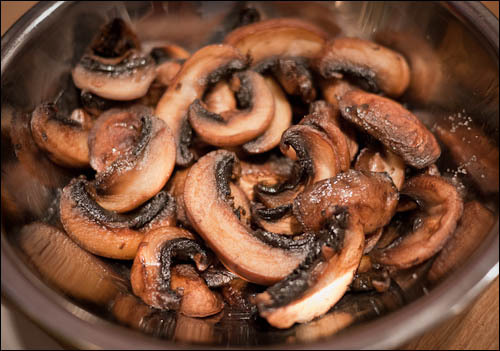 If you’ve sautéed mushrooms before you’ll know that when mushrooms give off their liquid the pan usually gets very moist. You want to avoid this, and by not overloading the pan you will. Don’t move the mushrooms as they cook. Let ’em sit there, browning. You can lift the pan and swirl it around if there is oil or mushroom moisture accumulating somewhere, but don’t stir the mushrooms. After a few minutes you’ll see the edges browning. At that point, flip them. I recommend using tongs and doing it one by one. (Using a spatula is frustrating because when you flip them they always land browned side down.) By the way, think in advance and add the raw mushrooms to the pan beginning at one side and moving towards the other (I go from left to right). That way, the timing works when you individually flip them following the same pattern. 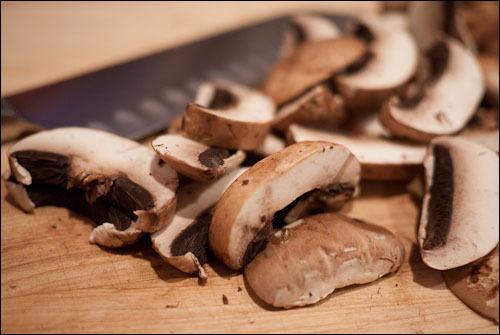 At the end of this process you’ll have a nice dish of properly browned mushrooms. Julia would be proud. Below, then, is my recipe for vegetarian spaghetti carbonara, which I’m going to call Blork’s Spaghetti alla Funghonara. This is adapted from Blork’s Classic Spaghetti alla Carbonara. About a dozen crimini mushrooms, thickly sliced. 1 or 2 cloves of garlic, minced. 1/4 cup grated Parmesano Reggiano cheese (more if you’re using a fine microplane grater*). 1/4 cup grated Pecorino Romana cheese (more if you’re using a fine microplane grater*). 1 egg, plus 1 egg yolk (ideally, eggs should be at room temperature). Brown the mushrooms in 2 tbsp olive oil over medium heat until they are nice and browned. (See above for notes on browning.) Set aside in a bowl tossed with a bit of salt. Lower the heat, add more olive oil to the pan, and sweat the garlic for a couple of minutes until it’s translucent. (Unlike with the mushrooms, you do not want to brown the garlic). Add the translucent garlic to the mushrooms and mix well. Mix the egg and egg yolk in a small bowl with a tablespoon or two of water (you don’t have to beat it like crazy, just mix it up a bit). Mix 3/4 of the cheese in with the eggs. When the pasta is ready, strain it in a colander and dump it back into the warm pot. Toss the egg-cheese mix into the hot pasta and stir it up so the heat of the pasta cooks the egg and everything gets nicely integrated. It should create a nice velvety sauce. If it’s a bit too thick or dry, slosh in a spoonful or two of the hot pasta water, but be careful! Too much will break the sauce. Scratch in a lot of freshly ground pepper and add the mushrooms along with some or all of the pan drippings and toss. If it tightens up, slosh in another spoonful of pasta water and stir it up.